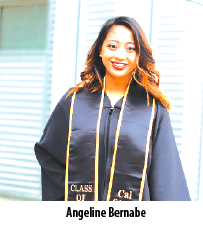 Cal State LA student Angeline Bernabe to graduate during the June 11 Commencement ceremony for the University’s College of Arts and Letters Los Angeles, CA — As a child, Angeline Bernabe developed a love for storytelling. That passion was fueled at Cal State LA and helped her become an accomplished student journalist and land prestigious internships. In the fall, she’ll be attending one of the top journalism programs in the nation at the UC Berkeley Graduate School of Journalism. The 22-year-old Bernabe says her parents always encouraged her to read newspapers and books and keep up with current events. She remembers her dad regularly watching television news, and recalls that she preferred watching news coverage over cartoons. She arrived at Cal State LA in 2011 after graduating from John F. Kennedy High School in La Palma, Orange County. As she acclimated to college life, she quickly realized that her college experience would greatly improve if she became involved on campus. Bernabe started with a job in the University Writing Center her sophomore year. But she didn’t stop there. Bernabe also became involved in the student startup of Golden Eagle Radio, working her way up to take positions as both station manager and president. Proving to be a pioneer driven by her passion, she also started the first Cal State LA chapter of Her Campus, an online magazine for college women. Each of her experiences broke ground in a new way and left a lasting impression on Bernabe. Her involvement on campus helped her win a 2016 Cal State LA Golden Eagle Award of Excellence, an honor presented by the Center for Student Involvement to recognize outstanding student achievement. Her experience as a student journalist helped her land internships at a local AM Christian talk radio station, and KCBS/KCAL as part of the station’s investigative unit. Bernabe also worked with Cal State LA’s EcoCar Team as the communications manager, traveling to Ohio with the team for the EcoCar3 competition. During her final quarter at Cal State LA, she worked on the reporting team for NBC’sDateline where she has already gained two assistant producer credits. At UC Berkeley, Bernabe plans to expand and refine her skills as a reporter and hopes to eventually become a news producer for long-form journalism pieces. Bernabe will graduate this spring with dual bachelor’s degrees from Cal State LA—one in communication with an option in public relations and another in TV, film and media studies with an option in broadcast journalism.